Honda introduces two new fuel-efficient models to the 2014 Accord Sedan lineup: the Accord Hybrid and the Accord Plug-in Hybrid. Accord LX models get new seat fabric. With the debut of new Accord Hybrid and Accord Plug-in Hybrid, the 2014 Accord Sedan menu expands considerably. The LX, Sport, EX, EX-L, EX-L V6, and Touring models continue. The Accord Hybrid is offered in base, EX-L, and Touring trim, while the Accord Plug-in comes just one way: with everything. A 2.4-liter 4-cylinder engine generating 185 horsepower is standard in LX, EX, and EX-L models, paired with a 6-speed manual transmission in the LX and EX and a continuously variable transmission (CVT) in the EX-L. The CVT is optional for the LX and EX. The Accord Sport also has the 4-cylinder engine, tuned to make 189 horsepower. A 278-horsepower, 3.5-liter V-6 engine and a 6-speed automatic transmission are standard for EX-L V6 and Touring models. This engine includes Variable Cylinder Management (VCM), which shuts down engine cylinders under certain driving conditions in order to conserve fuel. Honda’s new Sport Hybrid Intelligent Drive gas-electric drivetrain is installed in the Accord Hybrid and Accord Plug-in Hybrid. It combines a 2.0-liter 4-cylinder engine with an electric motor and a lithium-ion battery to generate a combined 195 horsepower. It takes three hours to recharge the Accord Plug-in using a standard household electrical outlet. Each Accord Hybrid model includes EV Drive, Hybrid Drive, and Engine Drive powertrain modes. With the Accord Hybrid, EV Drive allows for electric-only operation at low speeds and for short distances, or when the car is coasting. With the Accord Plug-in, EV Drive supplies 10 miles of pure-electric driving at normal speeds. Switch to Engine Drive, and the 141-horsepower, 2.0-liter 4-cylinder engine is the sole source of motivation. Depending on the trim level and transmission, the Accord 4-cylinder models return between 28 mpg and 30 mpg in combined driving, with the CVT providing greater fuel economy. 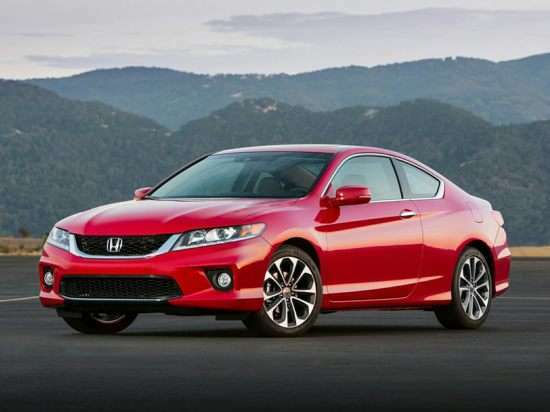 Accords with a V-6 engine get 26 mpg in combined driving. Choose the Accord Hybrid, and the fuel economy rating is nearly twice that of the Accord V6, at 47 mpg in combined driving. The EPA gives the Accord Plug-in Hybrid an overall efficiency rating of 115 MPGe. According to the National Highway Traffic Safety Administration (NHTSA), the 2014 Accord Sedan earns a 5-star overall crash-test rating. The Insurance Institute for Highway Safety (IIHS) has not officially rated the 2014 Accord as this summary is written, but in 2013 the Accord received a “Top Safety Pick Plus” rating, combined with a “Basic” rating for its front crash prevention technologies. All 2014 Accord Sedans have a reversing camera and Bluetooth connectivity with text-messaging capability. Move up the trim level ladder, and the car can be fitted with HondaLink connectivity, Lane Watch, Lane Departure Warning, Forward Collision Warning, an adaptive cruise control system, LED headlights, a navigation system, and more.